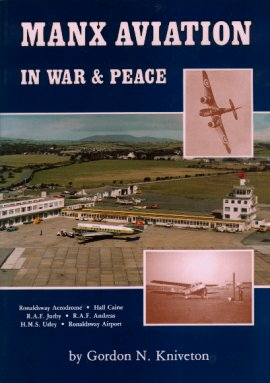 The main source of this text is a very interesting book called "Manx Aviation in War and Peace" by Gordon Kniveton and is published by The Manx Experience, 10 Tromode Close, Douglas, Isle of Man. October 1940 saw the arrival of the Royal Air Force in the Isle of Man. The Luftwaffe had been attacking the North West industrial centres of the United Kingdom under cover of darkness. Using long range Ju 88's they had also been attacking shipping on their way in and out of the Irish Sea ports. If they did not attack then they were relaying shipping movements to U-Boat packs waiting in the southern approaches off the SW Irish coast. To counter the threat fighter squadrons were deployed to new hastily constructed airfields all over the North of England, Northern Ireland and the Isle of Man. Ju88's like this attacked Irish Sea shipping In the Isle of Man the Jurby airfield accepted it's first aircraft in November 1940. Its command centre was to be Preston in Lancashire and became part of 9 Group, Fighter Command. Its sectors covered the Lancashire, Shropshire, and Cheshire. On the other hand a second airfield was being constructed only four miles away, again on the fertile north plain of the Island at Andreas. This was to part of another sector with responsibility for protecting the Irish Sea and its surrounds. These two airfields in the Irish Sea would play a vital part in protecting shipping in and out of the Irish Sea ports of Liverpool, Glasgow, and Belfast. By the spring of 1941 Andreas airfield was nearly complete. It was built to the full operational airfield specification of the time. It had the familiar three intersecting runways all joined by a perimeter taxiway. The main runway was NE/SW and 1,100 yards in length and 50 yards wide. This meant it would be able to accept aircraft larger than fighters. A total of 24 blast pens were constructed all around the perimeter. During the summer of 1941 the first Royal Air Force personnel arrived. Mainly police, they were sent to guard the mounting stores of supplies that was arriving every day. Next the new Station Commander Wg Cmdr E.V.Knowles arrived and took up residence in Glen Auldyn just outside Ramsey. His job was to ensure there was an efficient and safe environment for newly formed squadrons to build up operational fitness. In October 1941 RAF Andreas's first aircraft arrived, 457 Sqdn Spitfires came all the way from Jurby....four miles away! Later in October 1941 a detachment of Blackburn Skuas from 275 Air Sea Rescue Squadron arrived, their role was to prove very important. The next four months saw intense activity at Andreas. During this period, as the new sqadrons were building up their operational efficiency a fatal accident involving a Spitfire and a lorry crossing the end of the main runway caused the Air Ministry to insist on a major change to the local skyline. Andreas Parish Church had a tower some 120 feet high not far from the centre line and threshold of the main runway. This was very carefully dismantled, each stone numbered and the top of the tower rebuilt to half its height to lessen the hazard to landing and taking off aircraft. It still like this today. By March 1942 RAF Andreas was fully operational and by now 452 (Australian) Sqdn again with Spitfires had arrived to join 457 Sqdn who would be off to Redhill shortly for operations over N France. By now large four engined Focke Wulf Condors (like this one) were making regular trips at 30,000ft up and down the Irish Sea to monitor shipping in and out of Liverpool and other Irish Sea ports. He 111's and Ju 88's also continued their runs too. Now with an operations room at Ramsey Grammar School and radar stations at Dalby on the west coast of the Island, Bride in the north and Scarlett in south 452 and 457 Sqdn Spitfires were often sent to investigate "unidentified" aircraft picked out by these radar stations. 457 Sqdn returned to Andreas from Kenley following some very intense operations over France for a rest period and to take on more Australian pilots for operational training. June 1942 saw 452 Sqdn and 457 Sqdn embark for Australia where they were to join the allied forces in action against the the Japanese advance through the Far East. The third fighter unit to make Andreas its home would be 93 Sqdn. Originally this squadron were using Havocs equipped with radar and were primarily night fighters but the squadron was split and an entirely new flight was dispatched to Andreas with Spitfires and a completely fresh set of pilots and ground crew all with mixed nationalities. The Andreas posting was an ideal location to bring the crew together and build the squadron up to an efficient operational unit. During this period much use was made of the air to ground gunnery range along the Ayres coastline in the very north of the Island. They still had a war job to though, they continued the shipping patrols in the Irish Sea throughout their training period. In August 1942 the Station Commander Wg Cmdr Knowles was tragically killed flying a Handley Page Whitley when the aircraft failed to clear the Bride hills just to the North soon after take off from Andreas. The new CO would be Wg Cmdr Beaumont who arrived just after 93 Sqdn flew off to the heat of North Africa. All of a sudden Andreas fell relatively quiet apart from the detachment 275 Sqdn mentioned earlier and a couple of Supermarine Walrus amphibians continuing their air sea rescue role. Now that the initial emergency of the early war years had passed and the threats of Nazi invasions were not so urgent 9 Group had little to do and so Andreas more or less went into care and maintenance mode. 275 Sqdn kept the airfield operational but 1300 airmen and women were posted out to other more pressing locations leaving a skeleton crew behind. The control centre at Ramsey Grammar School also found a new role in March 1943. It became the Training Flying Control Centre and Wg Cmdr Bullmore was appointed CO. This was a fairly unique establishment since it was the only centre of its kind, controlling all training aircraft from 10 stations dotted around the Irish Sea area. It was staffed by just 230 airmen and women based in Ramsey. The Walrus aircraft of 275 Sqdn detachment continued to be seen on patrol around the Island along with some Lysanders and Defiants that were used to drop survival aids to ditched pilots in the Irish Sea. 275 Sqdn was primarily based at RAF Valley in Anglsey but the Andreas detachment remained there until October 1944. Another resident at Andreas was a Vought Sikorsky Chesapeake belonging to a detachment of 772 Sqdn Fleet Air Arm. This strange aircraft stayed at Andreas until the end of the war; it was part of No.1 Radar Training School of the Royal Navy. This was a very secret radar training establishment based on Douglas Head. The Chesapeake was used to provide simulated conditions for the students at the school. The aircraft was replaced in 1944 when it crashed into Douglas Head killing the pilot. The three storey building now accommodating Manx Radio was specifically built for the school. In the spring of 1943 another establishment made Andreas it's home. This was No.11 Air Gunnery School of Training Command who arrived in May. The role of the school was to train volunteer airmen in the skills of air gunnery. The students would endure a 10 week intensive course before being posted to heavy bomber squadrons equipped with aircraft such as the Lancaster, Halifax, Stirling and Wellingtons. No 11 AGS used 15 Avro Anson aircraft fitted with a Bristol turret (normally fitted to Blenheims) for air experience. For the advanced training in Frazer Nash turrets various Wellington bombers were seconded to the school. Target towing duties were undertaken by Miles Martinets an enlarged Miles Master (which were also at Andreas) specifically designed as a target tug. The Martinets (like the one in this picture) were soon replaced by Spitfires to provide students with target practice at something with the speed of true fighter. Now the skies over the north of the Island were constantly alive with Wellington bombers and Spitfires ducking and diving as well as the constant drone of Ansons and Martinets. Altogether Andreas became very busy indeed. By now the Americans were heavily into large scale daylight raids on Germany. Many American bombers were flown across the Atlantic and so because of the length of its main runway and the proximity to the ferry route Andreas acquired another role; that of an emergency landing airfield. There is one tale of a B17 arriving unannounced at Andreas. After landing it taxied to the end of the runway where it stopped. The air traffic staff waited for the crew to appear but nothing happened so the duty officer was dispatched to see if assistance was required. On recognising the uniform one of the American airman appeared and enquired where it was that they had landed. "Andreas in the Isle of Man" the officer replied. To this the airman looking very relieved said "Gee that's sure a relief, we reckoned we had to be somewhere in Norway!" Other visitors included a B24 Liberator with brake failure, they used a parachute trailing from the waist gunners position as a make shift brake chute. 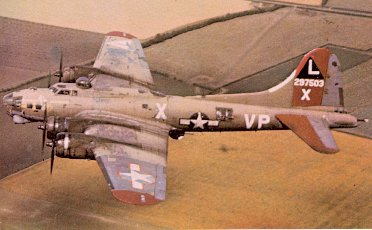 There were forced visits from a Lockheed P-38, a Martin B-26 and a whole flight of five Northrop P-61 Black Widows reportedly lost. After completing many tours of operations in Hamdens, Beaufighters, and Lancasters and following several visits to Canada and America Wg Cmdr Guy Gibson VC arrived at RAF Jurby as a part of a rather less demanding administrative position. Part of his duties now was to visit training stations and on this day Jurby and Andreas were at the top of his list of flying visits. Whilst in the Isle of Man he visited RAF Jurby, RAF Andreas and the radar stations at Dalby, Scarlett, and Bride. He then flew out again that day from Jurby. He was killed in action flying Mosquitoes later that year. No 11 AGS continues operations with no let up on activity. Although the war was over in Europe RAF Andreas still continued turning out trained air gunners for the war still going on in the Pacific. Remarkably after de-briefing, rehabilitation and home leave there were repatriated POW's returning to Andreas Air Gunnery School for re training courses on the latest turrets before returning to active bomber squadrons or becoming instructors themselves. The Chesapeakes of 772 Sqdn Fleet Air Arm were replaced in May by Boston 111's, Corsairs and Mosquitoes as they became surplus to active duties in Europe. The Bostons and some Fairy Barracudas were used from Andreas for a short while for the training of students at the Naval Air Gunners school at Ronaldsway Naval Air Station. This was short lived and the the 772 Sqdn detachment at Andreas disbanded in September 1945. No 11 AGS continued operations and was as busy as ever. 506 Sqdn Air Training Corps (Douglas High School Flight) spent a weeks camp at the station. This was particularly exciting for the youngsters since there were very good opportunities for long flights in Ansons and Wellingtons on long navigation training sorties. During this period some twenty Wellingtons, with slightly smaller number of Ansons, Spitfires and Martinets could be seen all along the dispersals. The only opportunity the local population ever had of visiting their local RAF station came on September 14th 1946 with a Battle of Britain Air Day. Unfortunately by now it had already been announced that the station was to close and that the Gunnery School would move to Jurby. By now the Station Commander was Grp Cpt G. C. Crawford and he with the help of WO Copeland made every effort to show what was involved in the work of the station. The Andreas Rescue Station, the link trainer, the parachute packing and all the survival aids such as dinghies, life jackets were all put on show. Lectures were given and in one of the hangars a gun turret used by the Gunnery School was made available for the public to try out. But alas the flying programme was a wash out. Low cloud and rain made it impossible for scheduled visits by a Halifax, Lincoln and a Mosquito. A display by one of Supermarines test pilots in the very latest Spitfire did not show also. However a Wellington and a Spitfire from the station did put on a brave show in appalling weather which was to be some of the very last operational flying from the station. The following week heavy trucks from Jurby emptied the hangars and huts systematically and the gates of R.A.F. Andreas were closed and locked up for the last time. As soon as the Royal Air Force left the Manx Government acquired many of the assets built by the R.A.F. for conversion to badly needed temporary family accommodation. Due to the construction methods they were badly affected by damp and were demolished as better accommodation became available. The old gymnasium and church still remain as a Parish Hall today. The Manx Government and the Air Ministry meanwhile were pondering as to what to do with the airfield. 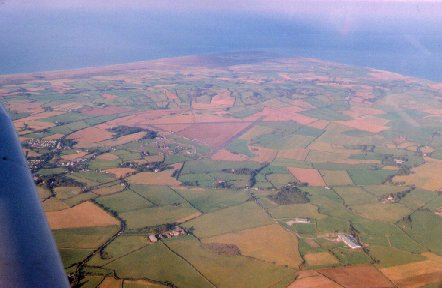 Tynwald accepted the offer made by the Air Ministry to purchase the 400 acres of land back for the original price paid collectively to the land owners in 1940 -- a total of £23,700. The buildings and services where included in the price as a gesture of appreciation for their co operation during the war. The Air Ministry did however stipulate that the runways should be kept intact and that no building should take place within the perimeter track. The airfield was now in the control of the Isle of Man Government Property Trustees and was put up for auction as a whole entity. It was purchased for £33,000 by Mr Morrey and is still owned by the family today. The old control tower with trees growing through windows, the rifle range butts, and many dispersals still remind any aviation minded visitor of the activity and the life that once went on here. Let us not forget also the twenty three R.A.F. servicemen who lost their lives at Andreas. Their graves are in the church yard of St Andrews Church whose tower still remains stunted today. What happened to the stones removed from the tower? They were all numbered and carefully stowed for rebuilding after the war. Well it is said that the church wardens of the day elected to accept a sum of money with which they purchased an electric powered blower for the church organ. Gliding took place on the Island initially by the Royal Air Force at RAF Jurby during the 1950's flying Slingsby T31's & T21's. After the RAF left Jurby gliding did not start again on the Isle of Man until the early 1990's when a group of enthusiasts started Manx Gliding Club at Jurby with a Slingsby T53 (BGA1787). This aircraft was one of the evaluation aircraft used by the Central Gliding School for the Air Training Corps in the 1970's. Unfortunately the T53 was grounded following a heavy landing. A Bergfalke II (BGA1492) was obtained by the club along with a re-lifed L13 Blanik (BGA1830) purchased privately by Dave Wiseman in 1992. Although the Blanik moved to The Andreas Flying Club in 1993 the group developed into a more formal organisation calling themselves The Islanders Gliding Club. Additional funds were spent on winches, ground equipment, additional aircraft such as an Auster and a Ka2b. The club also joined the BGA. By now the Islanders Club were suffering high rents and were forced to a small airfield at Hall Caine. (historically the Isle of Man's first airport) This site proved too small and with the lack of good flying opportunities members drifted to the Andreas Flying Club where some other members with the Blanik moved earlier. 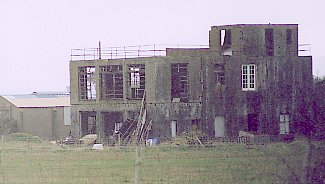 Before the Islanders moved to Hall Caine increasing costs and other conditions forced some members of the club to relocate at Jurby's satellite airfield at Andreas. The commercial arrangements here were a lot more "small club friendly" being privately owned rather than Government owned like Jurby. Gliding started at the Andreas airfield in January 1993 with the L13 Blanik, now named Boggles. We became a part of the Andreas Flying Club which covered all aspects of General Aviation including gliding and microlights. In May 1995 the L33 Blanik was purchased, followed by our tug aircraft and Auster (G-AHAU) in 1997 and a pristine Ka8 in 1998. The club also has use of an Ogar Motor Glider owned by the airfields owner Lionel Morrey. This provides excellent opportunities to soar the parts of the Island just out of reach of the conventional gliders. During 1997 it was agreed by the gliding members of the Andreas Flying Club that gliding side of things would be best served as a members owned club, running it's own affairs and paying rent for the hangarage and airfield use. The Andreas Gliding Club was born on the 1st Jan 1998.